Three decades into its stint, 300 South eatery is a local institution. During a visit to Cabin Fever in Trolley Square, I came across a kitschy coffee table book called Dads Are the Original Hipsters by Brad Getty. It's a collection of dad pics from decades ago, providing photographic evidence that the elusive concept of what we call hip has already been figured out by our progenitors—we're just appropriating it and calling it our own thing. That's the kind of vibe that I got when I visited The Other Place (469 E. 300 South, 801-521-6567). Some of Salt Lake City's coolest destinations have sprung up along the stretch of 300 South between State Street and 500 East, and the district as a whole embodies an effortlessly hip sensibility. The Other Place was there before this turn-of-the-century transformation, and its synergy with its more modern neighbors remains proof that cool is a state of mind. The Other Place first opened its doors in the mid-'80s. At the time, a diner that served breakfast all day wasn't a revolutionary idea—every city in the country had a few places like this. But The Other Place not only has a keen sense of its neighborhood, it's also honed its menu into an efficient hybridization of classic Greek and American cuisine you just can't get anywhere else. Sticking around as long as it has, The Other Place is a finely tuned machine, fueled by clarified butter, bacon grease and béchamel. Perhaps the surest sign of the restaurant's seamless steadfastness in a changing neighborhood is the clientele. I visited on a weekday morning and was surprised to see a well-rounded mix of old-school regulars and younger college students drinking coffee and munching on bacon and eggs. The Other Place no doubt owes a lot to its long-time frequenters, but it's also a place that my uber-cool, college-bound niece raves about. Breakfast was on my mind for this particular visit. Diner-style breakfast continues to evoke a measure of nostalgia—like many children of the 1980s, my family was a group of consummate road trippers. Random diners in West Yellowstone or Baker, Calif., were often how we refueled ourselves for another long day of travel. The smell of coffee and hash browns is in my DNA, and it has a Pavlovian effect on my salivary glands. A look at the breakfast section of the menu reveals a place with no shortage of hearty options. Pretty much any dinner-style cut of meat—steak, pork chops, veal, lamb chops—can be ordered with eggs made to order. Each option comes with a heap of shredded hash browns, and a choice of toast, muffin, one pancake or a slice of French toast. Personally, I love the fact that these additional choices are outlined on the menu—sometimes I get funny looks if I ask for pancakes instead of toast at most breakfast joints. The House Breakfast ($9.25) was my first pick—its combination of hash brown, eggs and a choice of breakfast meat seemed like a good way to break the ice and my fast. The meat options consist of the usual porcine suspects—sausage, bacon and ham are all there—but since The Other Place has Greek roots, gyro meat is also an option. The House Breakfast is a tried-and-true way to enjoy some early morning staples, though the sliced cheddar and Swiss singles were a bit out of place—shredded cheese tends to blend better—but this is a pretty minor gripe. Melty cheese is melty cheese. Ordering gyro meat with breakfast was a must for me, so I also tried the gyro omelet ($8.95, pictured), which was a bit of a revelation. 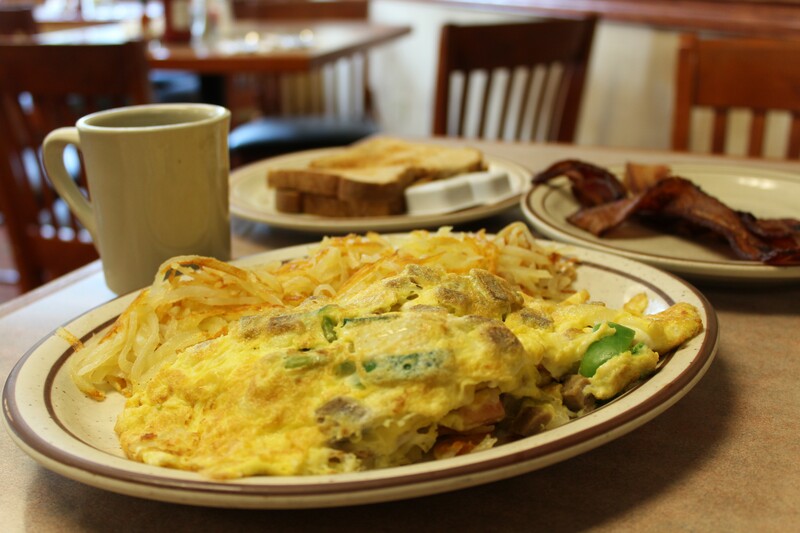 Full disclosure: This bad boy is definitely a lunch or dinner omelet—don't go ordering it at dawn's early light unless you're hung over. In addition to the spicy slices of lamb nicely distributed throughout the burrito-sized dish, you get feta cheese, tomatoes, green peppers, onions and zucchini. The feta and gyro meat combo is what got me—this flavor tag team packs a fantastic punch, and sometimes getting a wallop like that as the first meal of the day can seriously alter a person's trajectory. The breakfast side dish game at The Other Place has a few ups and downs. The hash browns are the kind of nondescript starch with a golden brown crunch that have been the foundation of diner menus since the dawn of time, and the toast was a tad over-cremated. I was a fan of their pancakes, however. As they're prepared by the same hands that create béchamel-dense Greek classics like moussaka ($13.95) and pastichio ($13.95), the pancakes here are of the stick-to-your-bones variety, achieving a nearly perfect rate of maple syrup absorption. While its location within a cool neighborhood definitely contributes to the continued success of The Other Place, that's not the full story. One of the earliest lessons that I learned about human beings is that simply hanging out with cool people doesn't make one a cool person. The Other Place has stuck around for more than three decades because it's had the confidence to stay true to itself over the years. Now that's what I call cool.